Item shown above : Solid wood in Mahogany FINISH with a glossy protective coat (Jersey shown not included). Hanger included. 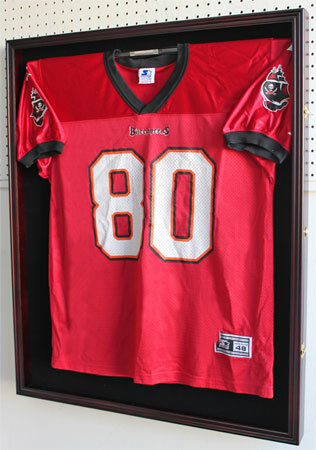 Where can you find a better jersey display case at such low price? Yes, only here. The picture speaks for itself. Unmatched quality. This jersey display case is made from hand selected hardwood. Repeated sanded to achieve smooth and elegant appearance. A great way to showcase an autographed or memorable Football, Baseball or Hockey jersey. Black matted background with jersey-friendly-material to creates a fancy and elegant contrast. The display case has a Hinged acrylic door cover to protect from dust and damage. Brass hinges, door latches, and wall brackets on the back for hanging(Wall mounted). Hanger rod included. No assembly required.